There are many FAQs in regards to the MEPS legislation – following on from yesterdays blog, we have answered even more of your questions. 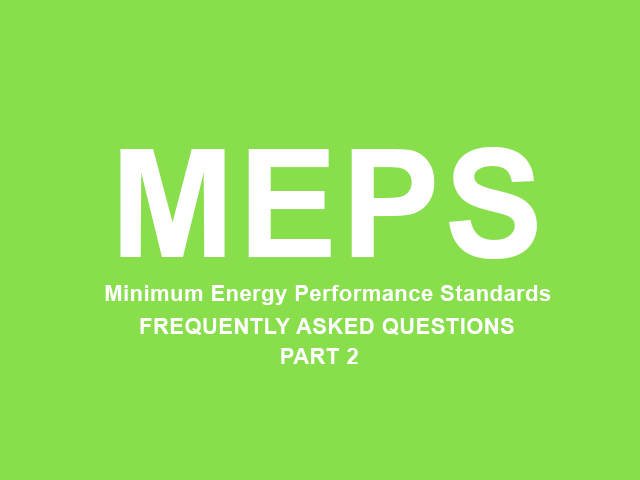 With the Minimum Energy Performance Standards (MEPS) legislation fast approaching, we are constantly being asked questions in regard to the legislation, below we have answered even more of your questions. I think my buildings listed – would I still need to comply? Listed buildings are usually outside of the scope of a property that requires an EPC. This is due to the minimal changes that can be made to a property when they are listed, which usually include a number of recommendations for improving the buildings efficiency. MEPS legislation only applies to those building that need to comply with the EPC legislation. If your property does not need to comply with the EPC legislation, it will not need to comply with MEPS. It is worth noting however that not all listed buildings are exempt from an EPC, it depends on the restrictions surrounding the property on completing works on the building. If I submit for an exemption from the legislation, how long would my exemption last, and would I be required to comply once the exemption is finished? The length of an extension varies depending on the nature of the exemption registered. Most exemptions last for five years, however some last for a shorter period of time. It can be found on the governments website how long each exemption last. Once your exemption period is over, you will then be required to comply with the legislation. How can I register an exemption? Exemptions must be registered on the PRS Exemptions Register, before the deadline approaches. If you require advice or assistance with registering for an exemption, click here to contact a member of our team. I am a landlord who lets holiday cottages throughout the year, am I still required to comply with the MEPS legislation? If your holiday cottage is let under a licence to occupy rather than a tenancy it will generally be outside of the scope of the regulations and you will not be required to comply with the legislation. If you are unsure if your property is let under a licence to occupy or a tenancy, you should seek legal advice to ensure you are compliant.